If you live in the Adirondacks and hunt, then the chances are pretty good you have some game in the freezer from your fall hunting excursions. You may also be at a point where you’re having a difficult time coming up with new, inventive ways to cook it. Luckily, venison, for instance, is very versatile and you can cook it pretty much any way you would cook either beef or pork. That’s why we’re sharing this delicious recipe for slow cooker pulled venison. With its spicy, saucy flavor, your family can enjoy it in a sandwich or in a taco, or even over Mexican rice. This recipe from Wide Open Eats yields about 8 servings, and needs to cook in your slow cooker for 10 hours, so plan ahead! You may also need a cup of broth, stock or beer. Cut roast so it best fits in the cooker, and place on top of onion. In a mixing bowl, combine the remainder of the ingredients. Pour over roast. If it appears there is not enough liquid, you can add a cup of broth, stock or beer. Meat should be almost immersed in liquid. Cover slow cooker; cook on low between 8 and 10 hours, or until meat is tender. 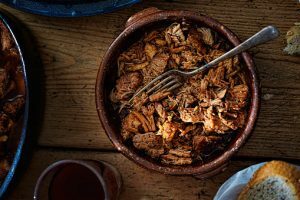 About 30 minutes before serving, shred meat using two forks, either in the slow cooker or on a cooking board. You bring the game and the slow cooker – Charlie Johns will bring all the other ingredients. We have everything you need, from canned goods and spices, to sandwich rolls and taco shells. Check out our book section for recipe books filled with more ways you can prepare wild game, too.